Want to save time and money on skip hire? Away With It has the solution! 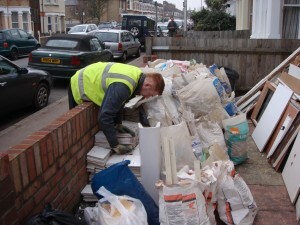 Over the last decade we have built a solid reputation for builders waste removal Bethnal Green homeowners and businesses turn to first for their DIY and construction rubbish disposal needs. Away With it provides fast and affordable builders waste removal in Bethnal Green E2 which is ideal for rip-outs and refurbishments and all kinds of building and home improvement projects. You only pay according the size of load. So our builders waste removal service is not only more convenient but can also be much more cost effective than hiring a skip. We provide a fast and reliable same-day service with bookings in two-hour slots and for your peace of mind we are fully licensed and insured. Find out how we can save you time, money and hassle.Call us today for builders waste removal Bethnal Green E2 on 0208 7390. We’ll be happy to discuss the most convenient and cost effective solution for your requirements. Or you can use our simple online form to request a quote and we’ll get back to you quickly with a competitive quote.